Callum McFadzean's goal means Sheffield United will take a one-goal lead into the second leg of their League One play-off semi-final against Yeovil. The Blades felt they should have had a penalty when Barry Robson seemed to be elbowed by Jamie McAllister. 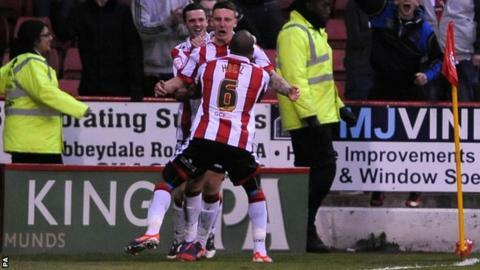 However, United went ahead just after the break when McFadzean's shot from 12 yards went in after a deflection. George Long produced an excellent reaction save to deny Byron Webster an acrobatic last-minute leveller. Sheffield-born McFadzean's effort against the Glovers was his first senior goal. The 19-year-old's brother, Kyle, plays for League One Crawley. The Blades, who lost last year's League One play-off final 8-7 on penalties to Yorkshire rivals Huddersfield, entered the play-offs with the unenviable record of six attempts and no promotions. They had failed to score in their previous three matches leading up to this encounter but went close when the returning Robson flashed a free-kick just past the post. That was as close as either side got in a first-half that was high in effort and energy but lacking in real clear-cut chances, while Robson went off injured and was replaced by McFadzean. Given the frenetic nature of the first-half it was something of a surprise that the deadline was broke within seconds of the restart. Chris Porter got in behind the Glovers defence to lay-off for Jamie Murphy whose cutback into the area came to McFadzean and his shot beat keeper Marek Stech via a deflection that went in off the post. Yeovil, who had relied on counter attacks started by Stech before the break, responded well and James Hayter chipped in from a marginally offside position. McFadzean came close to doubling the advantage for Chris Morgan's side after a clever run from the wing culminated in him firing straight at Stech before Murphy went close after drifting inside from the opposite side. For the visitors 22-goal Paddy Madden was finding it hard to escape the attentions of Blades centre backs Harry Maguire and Neill Collins and on the one significant occasion he did, the latter was there to clear his header off the line. Long was forced into late action from Webster's close-range overhead kick but the Blades held out. They travel to Huish Park on Monday hoping to reach a fifth play-off final but Yeovil boss Gary Johnson will have been encouraged by the endeavour shown by his side. "I thought we were excellent. Yeovil put us under a lot of pressure late on, which you'd expect. "We had a game plan and we stuck to it. We knew it was going to be tight on the night and we're pleased with a 1-0. "We're strong away from home as well. They know what our away record is like." "If we can be a bit better and take our chances on Monday then of course we're still well in it. "I thought defensively we were fantastic because we had to deal with a bombardment into our box. "We'll be up for it again and I know the Yeovil Town fans will be right up for it, it's a tight ground at Huish Park and I think it will be a cracking game.